In As You Like It, William Shakespeare compared the world to a stage, human beings to actors and life itself to a dramatic play. In a reverse of this parallelism, we humans visit theaters where we watch actors imitate our life dramas in scripted plays performed on stages. Costumes, scenery, props, sound, light, music and dance further enhance these lifelike theatrical illusions. With its origin in ancient ritual, theater has evolved through the centuries into two primary forms: tragedy and comedy. The prints and drawings in this exhibition explore both forms, focusing on the players and the audience. Nineteenth-century French artists such as Edouard Manet and Paul Gavarni often represented characters from the commedia dell’arte, an informal kind of theater that originated in 16th century Italy. By the 1890s, Henri de Toulouse-Lautrec was producing images that focused on the most prominent theatrical performers of the age. His works also explored the mix of social classes that attended performances in new theater spaces of Paris, such as the Moulin Rouge cabaret. Twentieth-century artists frequented popular dance halls, cabarets and circuses as well as more traditional theaters, operas and ballets. 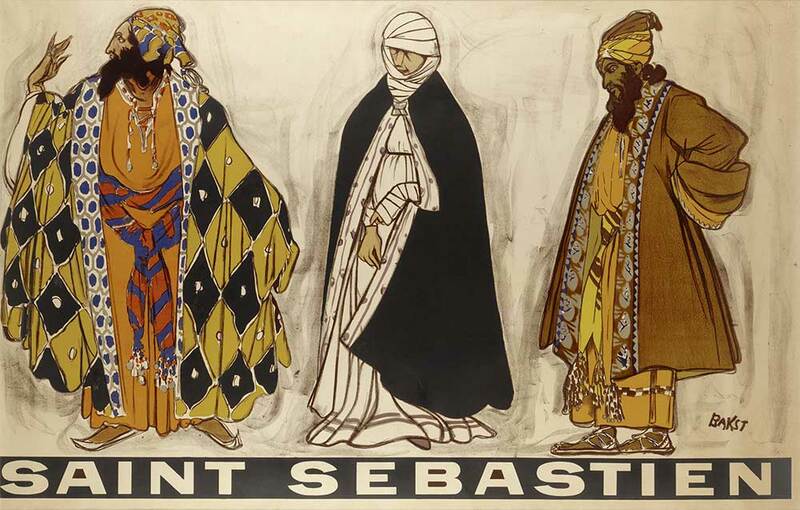 Russian-born artist León Bakst designed costumes for Serge Diaghilev’s famed Ballets Russes and other elaborate theatrical productions. His countryman and fellow artist, Marc Chagall, designed lively Cubo-Futurist sets and costumes for the Moscow State Yiddish Theater during the years following the 1917 Bolshevik Revolution. In Belgium, James Ensor’s art incorporates theater and masquerade as devices for biting social criticism. Image: 4 feet 4 3/4 inches x 6 feet 9 inches. Purchase: acquired through the generosity of the Leawood Women’s Club, Richard Shields, and Felice Stampfle in memory of her uncle Arthur J. Suiter, F85-9.